As January draws to a close it’s time to start looking at what character themed cafés we can expect in February. Before continuing this article be sure to check out our top 5 pick for characters cafes that opened in January as they are running until February and March. To celebrate the now-released 2019 remake of Resident Evil 2, Bar Rhythm in Akihabara is serving a special menu inspired by the video game. 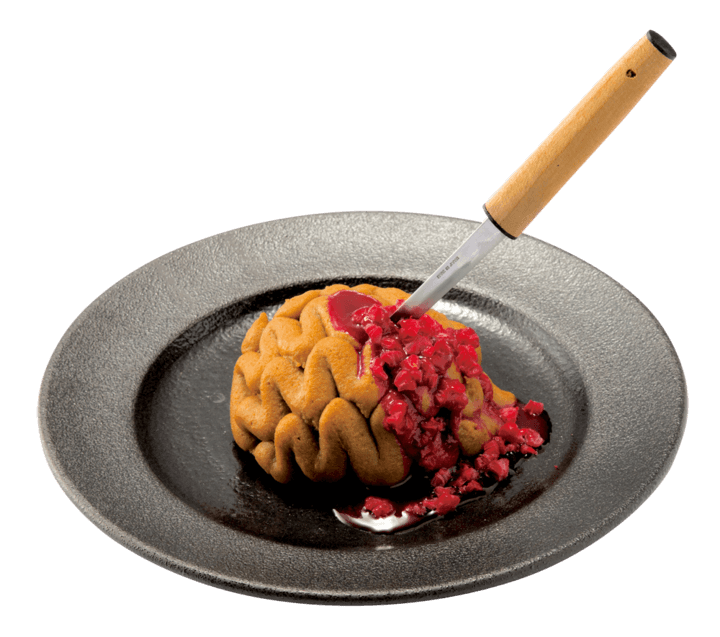 The menu includes a fun line-up of eye-catching food and drinks themed on the Resident Evil 2, the characters in the game and other motifs. Two different menus will in fact be served: the first from January 17 to 31 and the second from February 1 to 28, both offering up a range of different foods and drinks. Fans of the game won’t want to miss out on this one. To celebrate the release of the Psycho-Pass: Sinners of the System film trilogy, the Tower Records Cafe in Omotesando has opened a Psycho-Pass themed cafe called GINO THE CAFÉ based on the series character Nobuchika Ginoza. As part of the cafe’s theme, Ginoza will act as the manager, and this will be shown through decorations dotted around the cafe. An exclusive menu is lined-up which will be served by the excellent staff hired by Ginoza. There will also be merchandise available to buy with original designs. Don’t miss out! SEGA Entertainment is joining hands with the popular ongoing anime series My Hero Academia to open a limited time cafe at SEGA Ikebukuro GiGO next month. A whole range of themed dishes and drinks is waiting for fellow heroes out there including “Izuku’s Midoriya Demi Cup Plate,” “Shōto Todoroki’s Fire & Ice Pancakes” and more. You must reserve a table in advance to dine at the cafe, so don’t forget to book yours ASAP. Sanrio’s hugely popular characters Pompompurin and Gudetama will meet at the Yokohama and Nagoya branches of the Pompompurin Cafe for a special Valentine’s Day and White Day menu special. As a sneak peek example, the “Pompompurin & Macaroon’s 2 Coloured Love Love Curry” is mysterious black and white curry that has a mashed potato Macaroon filled with a meatball and Purin made from rice both of who are lovingly surrounded by lots of hearts. If your Valentine’s Day destination isn’t made up yet then how could your resist this collab? 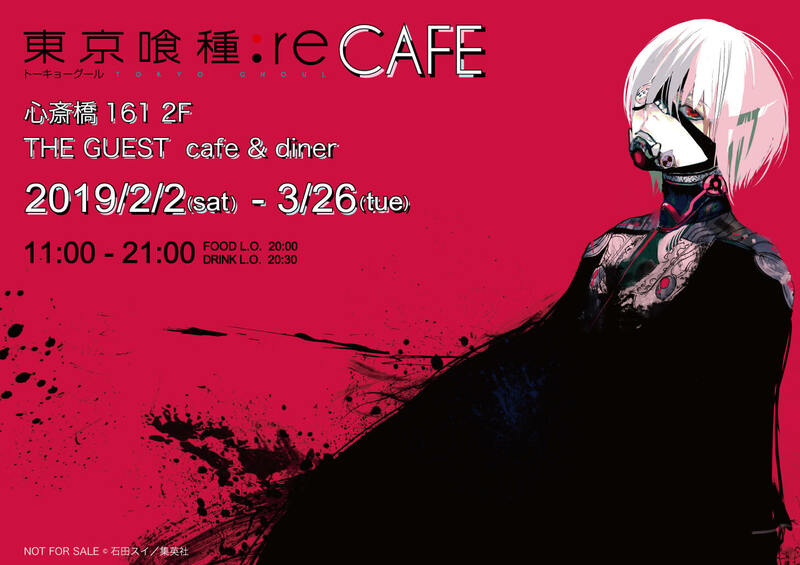 THE GUEST Cafe & Diner has announced a collaboration with Tokyo Ghoul:re to serve food and drinks inspired by the popular series at its branches in Tokyo, Nagoya, Fukuoka and Osaka for a limited time. When you order Kaneki’s Mask Curry your meal comes with a drink or sparkling non-alcoholic beverage of your choice served in a vessel inspired by Kaneki’s mask. You’ll look like Kaneki too when drinking out of it! Dining here offers a Tokyo Ghoul experience like no others, so fellow ghouls unite! THE GUEST Cafe & Diner OsakaRunning: February 2, 2019 – March 26, 2019Address: 161 Shinsaibashi, OsakaOpening Hours: 11:00-21:00 (Food Last Orders 20:00 / Drink Last Orders 20:30)*Details for the Tokyo, Nagoya and Fukuoka branches TBA. To celebrate Hello Kitty’s 45th anniversary the popular Sanrio character is now collaborating with the EGG & SPUMA cafe in Shinjuku Lumine EST. EGG & SPUMA’s hugely popular tea party set has been turned into a special Hello Kitty 45th anniversary version. 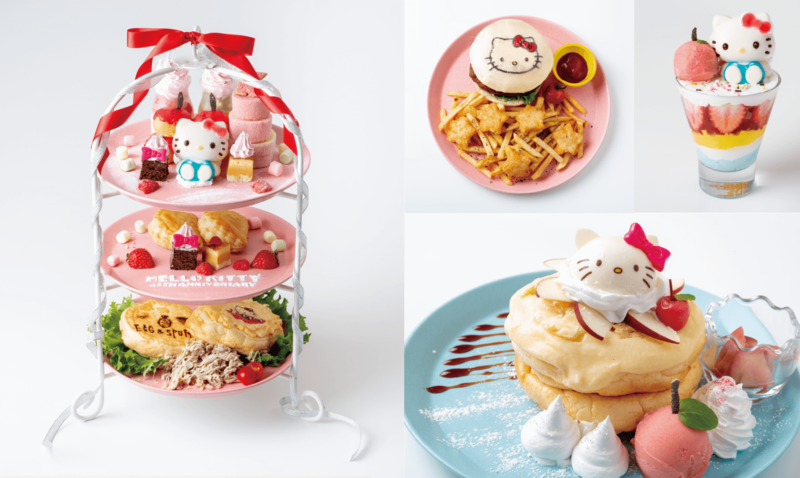 It comes with a roll cake tower, Hello Kitty’s favourite apple pie, and the cafe’s special tuna and mayo fluffy souffle pancakes. Don’t miss out on this special occasion to celebrate with Hello Kitty on her 45th anniversary. Tokyo Solamachi’s Kirby Café is making a comeback with a new story theme, some new items to the menu, new souvenirs and an upgrading of its interior design. 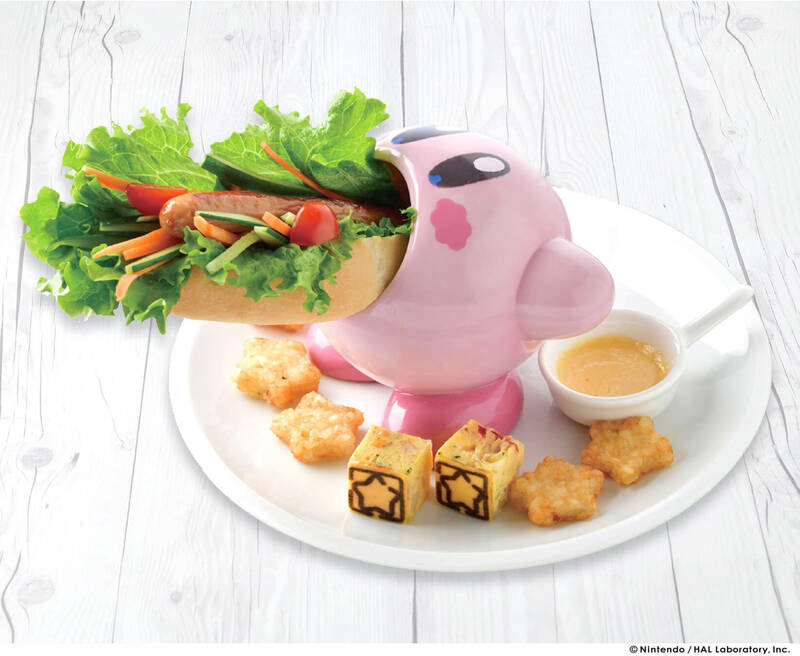 The menu includes new dishes like “Kirby Suction! Hotdog with Cheese Sauce,” “Coffee Curry and Whispy Woods Farm-Fresh Vegetable Curry” and more.